Paul Gydosh, CFP®, CRPC®, managing director of Kensington Wealth Partners in Columbus, Ohio and registered representative of Lincoln Financial Advisors Corp. (LFA), was named Marketing Committee chair for The Resource Group’s 2015 Board of Directors during the group’s annual meeting in Las Vegas, Nev. April 28 – May 1. The Resource Group (TRG) is an invitation-only, nationwide network of the top 200 planners within LFA. The goal of TRG is to collaborate, share intellectual capital – including financial planning expertise, resources, networking opportunities, and practice management strategies – and partner with home office executives and committee concierge support to help drive practice development among advisors and provide industry-leading service to clients. TRG’s Board of Directors is composed of chairpersons leading various committees and subcommittees made up of TRG members and home office partners. These committees deliver ideas and actions critical to the success of LFA advisors and their business. As Marketing Committee chair, Gydosh will focus on driving support for TRG members in the areas of marketing, media relations and advertising of their businesses through tools, educational materials, and best practices. 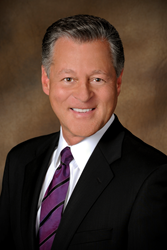 Gydosh, a 27-year industry veteran, joined Kensington Wealth Partners in 1988. In his practice, Gydosh provides counseling and implementation strategies for wealth preservation and transfer to individuals, business owners and executives of private and public enterprises, as well as foundations and trusts. He has been listed in Worth magazine as one of the top 250 financial advisors in America for multiple years and Columbus Business First has listed him among its Top Financial Planners every year since 2001. In addition, Columbus CEO magazine recently named Gydosh a Superstar in the Finance and Accounting category. Gydosh received a bachelor of science degree in electrical engineering from Ohio University in Athens, Ohio and a master of business administration degree from the Fuqua School of Business at Duke University in Durham, N.C. He holds the professional designations of CERTIFIED FINANCIAL PLANNER™ (CFP®) and Chartered Retirement Planning Counselor (CRPC®), as well as FINRA series 6, 7, 62, 63, 66 registrations. Gydosh’s office is located at 7650 Rivers Edge Drive, Columbus, Ohio. Lincoln Financial Group provides advice and solutions that help empower Americans to take charge of their financial lives with confidence and optimism. Today, more than 17 million customers trust our retirement, insurance and wealth protection expertise to help address their lifestyle, savings and income goals, as well as to guard against long-term care expenses. Headquartered in Radnor, Pennsylvania, Lincoln Financial Group is the marketing name for Lincoln National Corporation (NYSE:LNC) and its affiliates. The company had $218 billion in assets under management as of December 31, 2014. Learn more at: http://www.LincolnFinancial.com. Find us on Facebook, Twitter (@lincolnfingroup), LinkedIn and YouTube. To sign up for email alerts, please visit our Newsroom at http://newsroom.lfg.com.